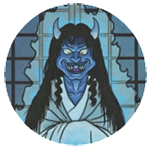 APPEARANCE: A kurote is a bizarre, hairy yōkai from the Noto peninsula in Ishikawa Prefecture. LEGENDS: Long ago in the province of Noto, there was a samurai named Kasamatsu Jingobei. 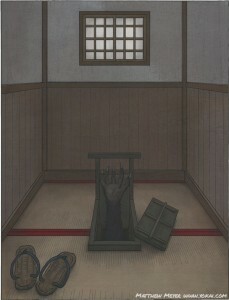 He lived in a nice house, as was typical of samurai at the time. One day, his wife went to use the bathroom, and something strange happened. While using the toilet, she felt a hand reach up from the darkness and stroke her behind. She told her husband, who suspected the work of a mischievous tanuki or kitsune. Jingobei drew his katana and entered the bathroom. Sure enough, as he stood over the toilet, something moved—an arm, covered in thick, black hair, reached up out of the darkness and began making a stroking motion. With one swing of his sword, Jingobei sliced the hand clean off. He put it into a box. The third priest examined the hand closely and snarled, “This is my hand which you cut from my arm!” He immediately transformed into a 9-foot tall, black-haired monster. He snatched the hand away, and then all three priests vanished. Sometime later, while Jingobei was walking home late at night, something like a quilt fell down from the sky on top of him. Wrapped up and unable to move, Jingobei was lifted up seven feet into the air and then violently slammed to the ground. When he came to, Jingobei noticed that the sword he was carrying on his belt—the one which he used to cut off the kurote’s hand—was missing.